Best value: see the best of NYC from only $79, Save up to 88%. A comprehensive and authentic New York experience. Best attractions & tours handpicked by New York tour experts. You have 12 months to redeem the pass after purchase. 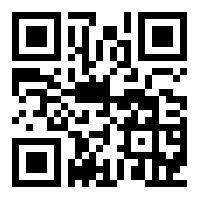 Attraction Pass is a comprehensive sightseeing pass that introduces you to the best of New York in 2, 3, or 5 days. Starting at only $79, you can easily explore the city in the most popular forms: by bus, boat, bike, and foot. What can I do with Attraction Pass™? 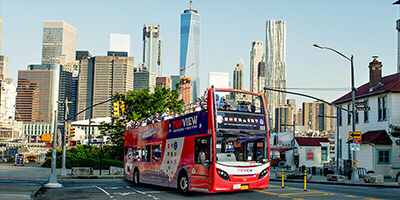 Start with a hop-on hop-off bus tour (Downtown Tour) to get an overview of NYC, then take a Liberty Cruise to gaze at the beauty of Lady Liberty and the Manhattan skyline. 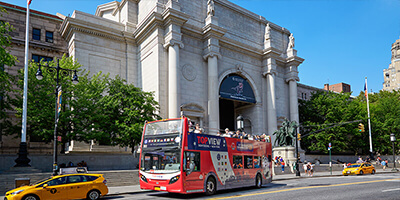 Continue with a ride through Central Park on two wheels, and visit one of the world’s most renowned scientific institution: American Museum of Natural History. In the evening, take in NYC’s stunning night views on the Night Tour. If you are interested in NYC’s culture and history, you don’t want to miss the Museum of the City of New York. To complete your New York experience, venture into NYC’s boroughs on the Brooklyn Tour and the Bronx Tour. When you return to Midtown, stop by Ripley’s Believe It or Not and engage in fun activities. 2 days will allow you to grasp the essence of New York, 3 days will give you a more in-depth experience, while 5 days give you plenty of opportunities to experience everything without rush. Why should I get Attraction Pass™? All tours and attractions included are handpicked by our tour experts, saving you the trouble of endless research. 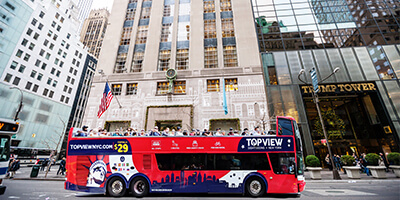 To enjoy the Attraction Pass, there’s no need to download any app: simply stop by TopView’s visitor center in Midtown and redeem all the boarding passes and admission tickets. With 12 months to redeem the pass, it’s never too early to buy. Get the best deal now and start your New York adventure with us!